In order to ensure the safety and security of the general public, K-9 detection in the retail industry is an important measure that can be a supplement to any existing security system. In addition to the proven detection and deterrence capabilities of our K-9s, the positive public relations associated with this service is of great value. Whether detecting explosives or narcotics, these full time dog teams are people friendly and provide a greater level of enhanced security. They can also be deployed at a moment’s notice in the event of a special need or in response to any disaster. Public awareness and acceptance of this service is imperative due to the high interaction of the K-9s with the general public. 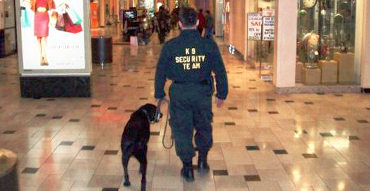 Whether you are looking for a high-visibility approach or specific detection sweeps during off hours, K-9 SEARCH & DETECTION, LLC‘s K-9s and handlers are committed to providing a comfortable and safe shopping environment.